OPTI-LYNX™ Trap Cartridges combine the convenience of our quick-connect holder with a versatile selection of packed-bed cartridges to offer chromatographers numerous options for on-line or off-line sample clean-up and pre-concentration. Each cartridge shares the same external dimensions, allowing you to use different diameters and porosities with the same holder hardware. 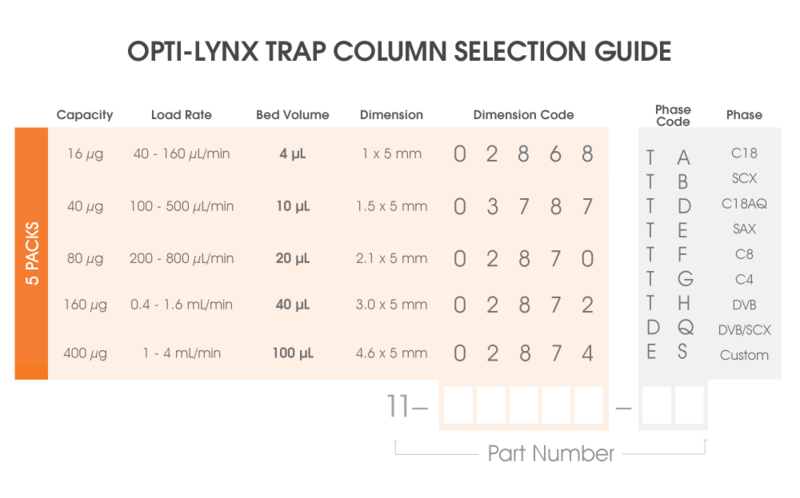 OPTI-LYNX™ Traps are available in packed-bed volumes of 4 µL to 100 µL with a wide range of standard and custom packings. Whether you want to separate a peptide digest from its matrix for further analyses, or prepare a dilute small molecule sample for LC injection without any sample loss - OPTI-LYNX™ Traps are the ideal tool to optimize your technique. These columns can be loaded and regenerated repeatedly for maximum value. Click the button below to add the OPTI-LYNX™ Trap Cartridges to your wish list.